Network is proud to add two early 1970s cult favourites to their 'The British Film' collection. First up is a brand new HD remaster of the 1972 renowned horror classic DEATH LINE (aka Raw Meat) starring Donald Pleasence and Christopher Lee, which makes its UK Blu-ray debut. 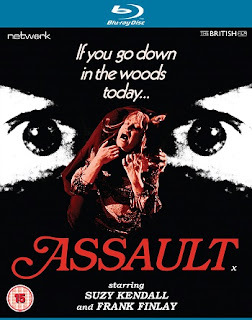 Alongside that is the hard-hitting 1971 thriller ASSAULT (aka In The Devil's Garden), a lesser known gem starring Suzy Kendall and Frank Finlay, which makes its worldwide Blu-ray debut. Donald Pleasence gives a memorable performance as an idiosyncratic police inspector hot on the trail of a nest of inbred subterranean cannibals in this notoriously violent arthouse slasher movie from the early 1970s. 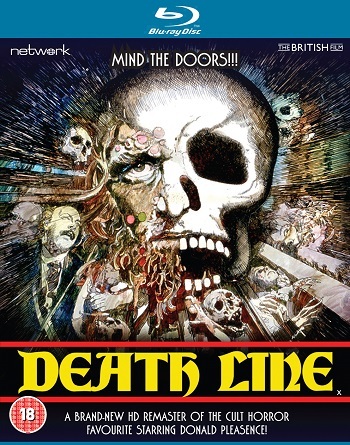 A long-time cult favourite, Death Line features stylishly grim imagery from Oscar-nominated cinematographer Alex Thomson and a rumbustuously sleazy soundtrack from Wil Mallone and Jeremy Rose. Transferred from original film elements it is presented here as a brand-new High Definition restoration in its original theatrical aspect ratio. Previously available only on DVD in the UK, Death Line has been newly scanned to 2K resolution from the original 35mm camera negative and extensively restored in its original theatrical aspect ratio of 1.85:1 for this exclusive UK Blu-ray release. The restoration involved careful grain management, both automated and manual removal of film dirt and damage, and correction of major instability, warping and density fluctuations. A one-off interview with the incredibly friendly Hugh Armstrong, who provides insights into his life and acting career, including his portrayal of ‘The Man’ in Death Line. A hard-hitting psychological thriller, Assault stars Frank Finlay as a career policeman willing to employ unorthodox methods to catch a sleazy murderer and Suzy Kendall as a plucky teacher willing to put her life in jeopardy to help him do so. Tautly directed by Sidney Hayers (Night of the Eagle), this controversial drama is presented here as a brand-new High Definition transfer remastered from the original 35mm camera negative. Assault has been newly scanned to 2K resolution from the original 35mm camera negative in its original theatrical aspect ratio of 1.85:1. The restoration carried out involved careful grain management, both automated and manual removal of film dirt and damage, and correction of major instability, warping and density fluctuations. Remastered from original film materials preserved by the BFI National Archive.